The League of NH Craftsmen presented 37 awards recognizing the creativity and skill of its juried members during the Annual Craftsmen’s Fair Preview Party, which was held on Friday, July 31. 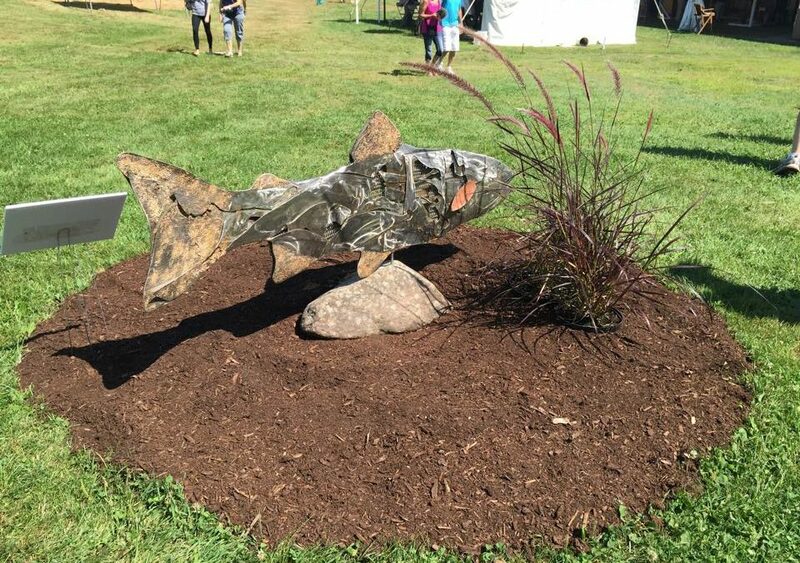 The award-winning craft pieces are currently on display at the 82nd Annual League of NH Craftsmen’s Fair, which is running now through Sunday, August 9 at the Mount Sunapee Resort in Newbury, NH. Photo courtesy of Carol Fusaro. Awards totaling $8,750 and two gift certificates were presented for exemplary work at the Fair’s three exhibitions: Living With Craft, CraftWear, and theSculpture Garden. 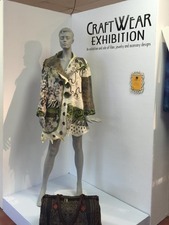 The CraftWear exhibition features stylish “art-to-wear” clothing, jewelry, and accessories for visitors to try on and purchase. TheSculpture Garden boasts a breathtaking display of landscape sculptures and garden ornaments. 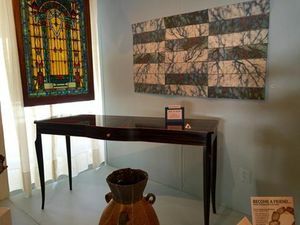 In Living With Craft, guests can envision their homes with a piece of handmade furniture, wall hanging or hand-crafted basket as they tour the exhibit, which showcases room settings with a creative fusion of handmade furniture and decorative items. Best in Show: Sponsored by Corzilius, Matuszewski and Krause Architects, PA.
Best in Traditional Design: Sponsored by Merrimack County Savings Bank. Best in Wood: Sponsored by Guild of New Hampshire Woodworkers. Best Turned Wood Piece: Sponsored by Guild of New Hampshire Woodworkers. Edith Grodin Best Collaborative: Anonymous Sponsor. Joe Tucker Metal Award: Sponsored by Nora and Norman Stevens. Stevens Glass Award: Sponsored by Nora and Norman Stevens. Best in Ceramics- Functional: Sponsored by the NH Potter’s Guild. Best in Ceramics- Decorative: Sponsored by the NH Potter’s Guild. Best in Weaving Award: Sponsored by the NH Weaver’s Guild. Gorst Print Awards: Anonymous sponsor. Best in Fiber: Sponsored by Sue King of Skyeview Alpacas. Best in Mixed Media: Sponsored by Mike & Wende Lonergan. Best in Contemporary Design: Sponsored by Mike & Wende Lonergan. Best in Photography: Sponsored by Cambridge Trust Company of NH. Excellence and Innovation: North Country Studio Workshops. Best in Show: Sponsored by Vahan and Anne Sarkisian. Best of Show Award: Sponsored by John & Jill Schiffman. Weaving with Wool Award: Sponsored by Pat & Chick Colony of Harrisville Designs. Best in Fine Sewing Award: Sponsored by Gretchen Rath of the Portsmouth Fabric Co.
Best in Metal Jewelry Award: Sponsored by Eleanor “Tin” Bacon. The Sue Williamson Memorial Award Best in Clothing: Sponsored by Joe Goodnough. Arts for All Award: Sponsored by Jean Laska & Robert W. Ladd. Best in Accessories: Sponsored by Molly Grant, Wild Orchard Guest Farm. Dorr Mill Award: Sponsored by Terry Dorr of the Dorr Mill Store. Best in Jewelry: Sponsored by Pam Peterson of Gondwana & Divine Clothing Co.
Best in Seed Bead Weaving: Sponsored by Donna Nordlund of Bead It! Excellence in Polymer Clay: Sponsored by the New Hampshire Polymer Clay Guild. Most Original Piece: Sponsored by North Country Studio Workshops. Fairgoers will also have a chance to vote for their favorite craft piece. Visitors can cast their votes in the ballot boxes located at each of the exhibitions. The winners will be announced on Saturday, August 8.
sonsole table by Terry Moore won Best in Show in the Living With Craft exhibition. Photo courtesy of Carol Fusaro. The 82nd Annual League of NH Craftsmen Fair will be open from 10:00 am to 5:00 pm daily, rain or shine, until August 9. Admission is $12 for adults; $10 for seniors, students, active duty military (with ID), and groups of 20 or more. Admission is free for children 12 and under. A ticket includes admission to all exhibitions and demonstrations. A ticket for a second return day is available for an additional $5. Picnic areas, as well as a food tent, indoor cafeterias, and an outdoor Garden Café (serving adult beverages) are open daily. Parking is free. Please leave pets at home; only service dogs are allowed on the fairgrounds. The League of NH Craftsmen is a non-profit, craft education organization. Its mission is to encourage, nurture and promote the creation, use and preservation of fine contemporary and traditional craft through the inspiration and education of artists and the broader community. The League represents the signature of excellence in fine craft, through the work of its juried members, and its rigorous standards for self expression, vision, and quality craftsmanship. The League of NH Craftsmen is supported in part by grants from the New Hampshire Charitable Foundation, the New Hampshire State Council on the Arts and the National Endowment for the Arts. For more information about the Fair, or the League of NH Craftsmen, call 603-224-3375, email nhleague@nhcrafts.org, or visit the League’s website at www.nhcrafts.org.